So I found something that is delish!! Go Go SqueeZ apples with cinnamon tastes great and is all natural. No preservatives or artificial colors/flavors. I love them and so does Abigail. It’s about 4 pouches for $2.00. Since I am still keeping Abigail away from gluten at the moment, I found these pasta noodles that are gluten free. She LOVES spaghetti and wants it a lot. So I feel great using these noodles. They taste the same as regular noodles and are almost the same price. So it’s a great choice. I bought some other noodles to make her something besides spaghetti…I’m just not sure yet of what to put with it. So that will be an upcoming task today! 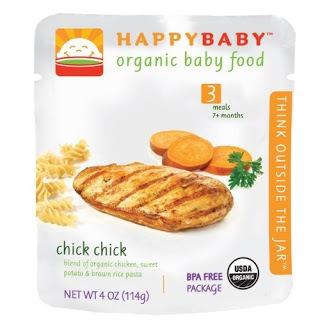 I also found a great deal online with Happy Baby Organic food. It’s meals in pouches instead of glass bottles. Seriously, Organic chicken is expensive but this deal was great. I ordered in on Amazon and paid about $17.00 for 16 pouches. So about $1.00 a piece. I saved like $10 on this! It has Organic chicken, sweet potatoes, and brown rice. Fantastic! Here are my food finds…hope this gives you more ideas and that you enjoyed!